First I would like to start with the fact that this demo was lying around in my HDD since Halloween. This demo was written to demonstrate how easy it is to utilize the DS’s hardware blending and create impressive effects with no effort. 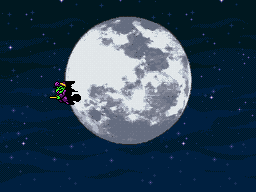 In this demo, the witch is flying in the sky, and whenever she’s hovering between the moon, she turns black, because the light from the moon illusions it as such. The demo is composed of 2 backgrounds and a sprite. the sprite is set to blend with the first background (the moon) with 0 blending, resulting the black color. It’s a nice demo! simple but effective. :) Although I wonder if the background + moon and witch are free to use for other projects?